We all know how important it is to have strong passwords for our accounts, but also to keep them safe from prying eyes. 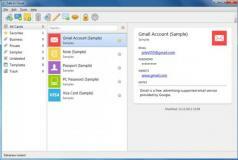 SafeInCloud is a password management tool that helps you safely store, manage and organize all your passwords. The application uses the 256-bit AES algorithm to encrypt your data so unauthorized access is impossible. Data can be easily imported from CSV files, popular applications like Access Manager, KeePass, FileZilla...etc., but also from web browsers such as Firefox and Chrome. There are various preset options for storing your passwords such as Email Account, Code, Credit Card, Long/Password, Web Account, Membership and others. The parameters also change depending on the type of card you’re using. SafeInCloud also lets you add personal notes and images in the main panel. Data can be exported as plain text, CSV and XML files and the program also includes backup and restore options as well as the possibility to erase information. Through Chrome integration it lets you sync data with any of the popular cloud storage services like Dropbox, OneDrive or Google Drive.